A chronograph watch is a display watch with a timer (stopwatch) function. 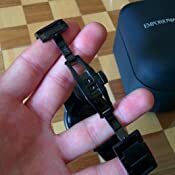 To use the timer function, push the bottom button on the side of the watch to set the second hand to zero (if it’s not on zero yet) and push the top button to start and stop timing. Find out more about chronograph watches here. Dispatched from and sold by CAMAR SHOP. 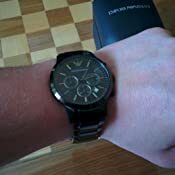 5.0 out of 5 starsWonderful watch, superb service. 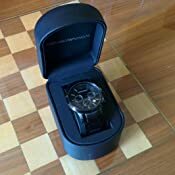 As my photos are currently allowing you to feast your eyes on, this watch was delivered very well packed, with official and original packaging and display case, within two working days from clicking the order button. I cannot fault Tic watches on their delivery using DPD and careful and expected packaging quality. The watch itself is beautiful. The black stainless is chrome and brushed and the face is clean and tidy. It's a relatively heavy watch, but that's what I personally go for. Every box you'd expect from a formal dress watch is ticked however I see no reason for not wearing this on a regular, casual, daily basis. 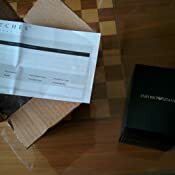 The instruction manual in the box correctly comes with Italian prior to English and a crystal clear return form from Ticwatches is also a pleasant and reassuring touch. For the £129.00 Amazon price, I do not have a single complaint to make. I will keep this review updated on a semiannual basis. I got this watch for my other half for Christmas. Came in good time and is perfect. 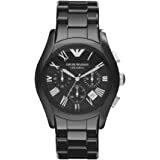 I got it at a very good price and when i went to Armani they authenticaed it. So they are real . Really happy boyfriend. 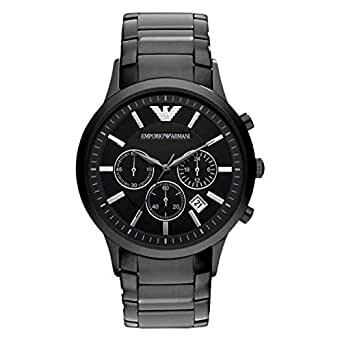 deliberated for far to long about choosing a black watch, finally settled on this one and am very much in love with it. Dark and difficult to read at night, (most black watches will be) but i don't care, it looks amazing. 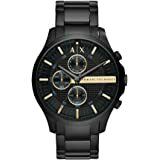 I bought this watch as a gift for my partner and he absolutely loves it !! It came on time and the packaging was very smart. It also came with a certificate to prove it was real. Overall great watch very happy with purchase! Looks really great, at a good price too. I bought this watch for my husbands birthday which hasn't arrived, but I'm sure he will be over the moon.